Living in Dubai, one of the most multi-cultural cities in the world; many parents encourage their children to learn multiple languages; mainly Arabic starting from the young age. In response to this; we have opened a fully immersed Arabic language class running on Sundays, Mondays and Tuesdays from 8.00 – 12.30. 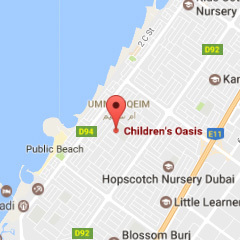 “This works exactly like the Spanish class where the group will be from 18 months to foundation stage and your child can do a split week with Arabic and English,” says Ms Cait, Children’s Oasis Nursery head teacher. For example 2 or 3 days in Arabic and the remaining days in English. The minimum in either language is 2 days. The afternoon Arabic classes also continue. We firmly believe that exposing children to languages from a very young age is so important. Living in an Arabic country it is only natural for children to be exposed to the language through play and song.